Archives : TRENDS IN CONFLICT - 29 /05/2015. TRENDS IN CONFLICT - 29/05/2015. After sliding for the last three days, market recovered on Friday and made a big white body candle. But that does not reduce the uncertainty in the market as the trends are still not in unison. The short term trend has turned up but the medium term trend still remains down. As a result, the Average Directional Movement Index indicates that the downtrend has lost its strength. Whenever its value goes below 20, it indicates a difficult time for traders. Long term uptrend will resume only if Nifty closes above 8690. Please Note that there will not be weekly updates dated 05/06/2015 and 12/06/2015. Next weekly update on 19/06/2015. Inconvenience caused is regretted. Sensex opened the week at 27893, made a high of 27903, low of 27354 and closed the week at 27828. Thus it closed the week with a loss of 129 points. At the same time the Nifty opened the week at 8438, made a high of 8443, low of 8270 and closed the week at 8433. Thus the Nifty closed the week with a loss of 25 points. On the daily charts, both the indices have formed a big white body candle on Friday after moving lower for the last three days. On the weekly charts, both the indices have formed a Dragon Fly Doji. But considering last two weeks candles, it is a Bearish Harami Cross. This pattern requires a confirmation in form of a bearish candle next week. Thus daily candlestick pattern suggests more bullishness as compared to the weekly pattern. The market is witnessing a pull-back of the entire fall from Sensex 30024 and Nifty 9119 and the relevant correction levels are 27799-28224-28649 for the Sensex and 8425-8558-8690 for the Nifty. Hence the long term uptrend will resume once Sensex manages to stay above 28649 and Nifty above 8690. This week both the indices managed to close above both the long term average of 200dma (Sensex – 27676 and Nifty – 8332) and even the short term average of 20dma (Sensex – 27426 and Nifty – 8300). However, both the indices have just stopped below the medium term average of 50dma (Sensex – 27841 and Nifty – 8437). Thus the trend in the short term and long term timeframe has turned up whereas the trend in the medium term timeframe continues to remain down. MACD and Price ROC continue with their Buy signal. RSI (54) suggests bullish momentum. Stochastic Oscillator %K (68) has just gone above %D, thereby signaling a Buy. MFI (60) suggests positive money flow. OBV continues to make lower top lower bottom formation. ADX has decreased to 17, suggesting that the current downtrend has lost its entire strength. Directional Indicators have converged but still remains in Sell mode as +DI is still below –DI. Thus majority of Oscillators are suggesting a bullish bias in the near term. Options data indicates highest Call Open Interest buildup at the strike of 8800 and highest Put build-up is at the strike of 8000. Thus Option data suggests a wide trading range with support coming in at 8000 and resistance around 8800. Friday saw strong open interest being added to the 8300 Put and hence the level of 8300 will act as strong support in the near term. 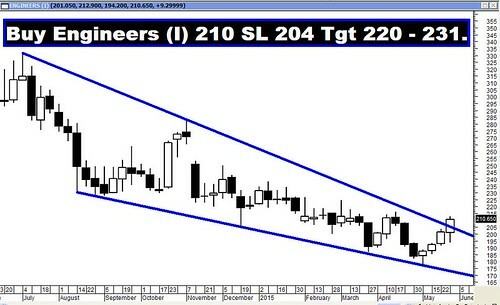 Trendline Resistance for the Sensex is at 27966. Trendline Resistance for the Nifty falls at 8508.